The Alterac Brew-Pup can be purchased from the Blizzard Store either as a standalone digital item, or as part of a special bundle that includes the Enchanted Fey Dragon mount. The pet costs $10 while the pet and mount combo is $30. 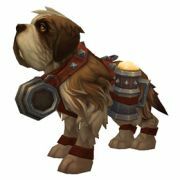 For every Alterac Brew-Pup purchase made between now and December 31, 2013, Blizzard will donate $5 to the Make-A-Wish Foundation.